Attack Of The Hundred Yard Hardman! 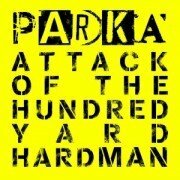 Boisterous, Scottish indie rockers Parka released their indie opus ‘Attack of the Hundred Yard Hardman’ on 5th May 2008. The album was preceded by their latest single, indie dancefloor favourite ‘Better Anyway’, on April 21st which landed at number 5 in the Indie Charts. Coming straight off the back of January’s 100mph dancefloor-punk workout single ‘Disco Dancer’ which stormed to number 3 in the indie charts and was also Alex Zane’s Record of the Week on his Xfm Breakfast Show, the eagerly anticipated album hits the shops in time to become the soundtrack to the summer. Produced by Iain Gore who has also recently worked with Rumblestrips, Kid Harpoon, Hadouken and of course SixNatioNState, ‘Attack of the Hundred Yard Hardman’ sees Parka continue the relentless pace of ‘Disco Dancer’ and ‘Better Anyway’ with more raucous anthems. Packing in the punches from the offset the staccato rap of live favourite ‘Bosses & Bastards’ sets the unruly party mood before the baggy stylings of ‘Mr. Optimistic’ which was co-written with Chewin’ The Fat actor Tom Urie. Tom has previously lent his vocals to Mylo’s Destroy Rock and Roll album and provides vocal support on most of Parka’s debut. There is the rabble rousing, self motivation of ‘Wake Up Call’ (written following a few stern words from Jeepster), while ‘Stay Away’ sees the band at a rare introspective moment, backed by an 8-piece orchestra, a 3-piece horn section and Micko Larkin from the sadly missed Larrikin Love on guitar. The album will be available on CD and download only with ‘Better Anyway’ being released on three track CD single, limited red 7″ and download.